The craniovertebral junction (CVJ), or the craniocervical junction as it is otherwise known, is composed of the occipital bone that surrounds the foramen magnum, the atlas vertebrae, the axis vertebrae, and their associated ligaments and musculature. CVJ abnormalities are a varied group of conditions with different etiologies and have the potential to affect CSF flow by fourth ventricular outlet obstruction, venous flow abnormalities, or other mechanisms. Here we review the pathogenesis, presentation, and imaging characteristics of Chiari I and Chiari II malformations. We describe the pathogenesis of hydrocephalus associated with these conditions as well as the management strategy and treatment options. In addition, we describe other CVJ abnormalities associated with hydrocephalus and the optimal treatment strategy. These include basilar invagination, basilar impression, and achondroplasia. The craniovertebral junction (CVJ), or the craniocervical junction (CCJ) as it is otherwise known, is composed of the occipital bone that surrounds the foramen magnum, the atlas vertebrae, the axis vertebrae, and their associated ligaments and musculature (Dlouhy et al. 2015). CVJ abnormalities are a varied group of conditions with different etiologies and have the potential to affect CSF flow by fourth ventricular outlet obstruction, venous flow abnormalities, or other mechanisms. This chapter will review Chiari malformations and other CVJ abnormalities associated with hydrocephalus and discuss pathogenesis, presentation, imaging, and management options. Chiari I malformation (CM-I) is a CVJ abnormality initially described by Chiari, Arnold, and Cleland and consists of downward herniation of the cerebellar tonsils through the foramen magnum into the cervical spinal canal (Chiari 1896; Cleland 1883; Chiari 1891; Arnold 1894). Classification of tonsillar herniation/ectopia as a CM-I is typically reserved for tonsillar displacement greater than 5 mm below the plane of the foramen magnum on sagittal magnetic resonance imaging (MRI) (Smith et al. 2013; Aboulezz et al. 1985; Barkovich et al. 1986; Elster and Chen 1992; Mikulis et al. 1992). The cause of tonsillar herniation in CM-I is unclear although one theory suggests that underdevelopment of the occipital bone and overcrowding of the cerebellum in a small posterior fossa are the underlying etiology (Chiari 1896; Nishikawa et al. 1997; Badie et al. 1995). Nishikawa et al. (Nishikawa et al. 1997) conducted a radiographic study of 30 patients with CM-I malformation and 50 normal control subjects to assess posterior fossa volume. Compared to the control group, the CM-I group had a significantly smaller posterior fossa volume, the occipital bone was significantly smaller, and the tentorium was pronouncedly steeper. They concluded that in adult-type CM-I, an underdeveloped occipital bone, possibly due to underdevelopment of the occipital somites originating from the paraxial mesoderm, induces overcrowding in the posterior cranial fossa, which contains the normally developed hindbrain (Milhorat et al. 1999). Reduction of the height of the occipital bone, accentuation of the slope of the tentorium cerebelli, and underdevelopment of the clivus associated with herniation of the cerebellar tonsils argue in favor of the mesodermal origin of this malformation (Chiari 1891; Milhorat et al. 1999). Other studies have found similar results with a reduction in the volume of the posterior fossa and the amount of CSF contained within, but normal volume of nervous tissue (Badie et al. 1995; Milhorat et al. 1999). Compression of fluid spaces by cerebellar tissue in the small posterior fossa interferes with CSF circulation, which is theorized to account for many of the symptoms observed with CM-I (Milhorat et al. 1999; Oldfield et al. 1994). Additionally, adhesions and arachnoid veils may also obstruct CSF flow through the foramen of Magendie and may also place a role in the pathogenesis of Chiari I malformation and syringomyelia (Tubbs et al. 2004). CM-I can present at any age from child to adult. In different surgical case series, presenting age varies depending on the physician’s patient population and referral patterns. The mean age of presentation was 35.9 ± 16.8 with a female preponderance, in Milhorat’s surgical series of children and adults (Milhorat et al. 1999). The presence of syringomyelia lowered the age of surgical presentation to 24.7 ± 16.6 years. The most common symptom, occurring in up to 81% of surgical patients, is suboccipital headache that is worsened with head dependency and Valsalva-type maneuvers such as coughing, straining, and exertion (Milhorat et al. 1999; Tubbs et al. 2011). Over 70% of surgical patients present with either ocular disturbances (such as diplopia, blurred vision, or retro-orbital pain) or otoneurological disturbances (such as dizziness, disequilibrium, tinnitus, or ear pressure). Lower cranial nerve, brainstem, and cerebellar findings include dysphagia, sleep apnea, dysarthria, tremors, impaired gag reflex, and poor coordination. Syringomyelia occurs in 45% to 68% of surgical cases, and it is associated with scoliosis in up to 42% of surgical patients (Milhorat et al. 1999; Greenlee et al. 2002; Park et al. 1997). CM-I can be associated with other osseous abnormalities of the craniovertebral junction, which varies significantly depending on patient population and referral patterns to different institutions. In our series at the University of Iowa, an abnormal retroflexed odontoid process was seen in 26% and basilar invagination in 12% of surgical patients (Milhorat et al. 1999; Menezes et al. 2005; Dyste et al. 1989; Dyste and Menezes 1988). Sensory and motor findings due to spinal cord dysfunction are common, especially when associated with syringomyelia. Over 90% of patients with syringomyelia present with spinal cord disturbances such as paresthesias, pain, burning dysesthesias or anesthesia, weakness, spasticity, atrophy, incontinence, trophic phenomena, impaired position sense, or hyperreflexia (Milhorat et al. 1999). Presentation in CM-I is most often attributed to syringomyelia, brainstem compression, or cerebellar compression (Table 1). The presence of hydrocephalus exacerbates CM-I presenting symptoms. More than a third of presenting patients report lifelong complaints of headaches or clumsiness (Milhorat et al. 1999). Prior to the advent of MRI, diagnosis of CM-I was based on clinical suspicion supported by plain radiography, myelography, computed tomography (CT), and sometimes vertebral angiography. Plain radiographs are abnormal in 89% of cases (Dyste et al. 1989). Abnormalities including shallow posterior fossa, scoliosis, widened spinal canal, shortened clivus, retroflexion of the odontoid process, basilar invagination, Klippel-Feil syndrome, and atlanto-occipital assimilation (failure of segmentation between the fourth occipital sclerotome and the first spinal sclerotome) can be demonstrated by plain radiographs (Dyste et al. 1989). MRI has revolutionalized the diagnosis of all Chiari malformations. MRI abnormalities include crowding of the CSF spaces within the region of the CVJ, tonsillar herniation below the foramen magnum of at least 5 mm, reduced height of the supraocciput, and increased slope of the tentorium (Milhorat et al. 1999). MRI can also demonstrate abnormalities of CSF circulation including compression of the fourth ventricle, empty sella, hydrocephalus, syringobulbia, and syringomyelia. Patients who undergo phase-contrast cine MRI show evidence of decreased CSF velocity/flow in the cisterna magna and subarachnoid space posterior to the cerebellum and in the premedullary and prepontine spaces anterior to the brainstem (Milhorat et al. 1999). It is important to note that the clinical significance of radiological studies depends on the patient’s presentation. A subgroup of patients exist with Chiari malformation who do not have frank tonsillar ectopia but have syringes that respond to posterior fossa decompression (Tubbs et al. 2001; Iskandar et al. 1998; Chern et al. 2011). Likewise, there is known to be great variance in tonsillar position in asymptomatic individuals (Elster and Chen 1992; Mikulis et al. 1992). Hydrocephalus has been associated with CM-I since Hans Chiari’s original report of an autopsy case in which the patient had tonsillar herniation and died of hydrocephalus (Chiari 1891). In reported case series, hydrocephalus is rare in CM-I, occurring in only 6–11% of cases (Milhorat et al. 1999; Tubbs et al. 2011). This association is further complicated by the observations that hindbrain herniation can both be the result of hydrocephalus and result in hydrocephalus (Figs. 1 and 2). The mechanism of hydrocephalus formation in patients with Chiari malformation is heterogeneous and multifactorial and therefore differs between patients (Figs. 1 and 2). Here we discuss two mechanisms by which hydrocephalus may be associated with CM-I. Triventricular hydrocephalus, or supratentorial hydrocephalus, caused by aqueductal stenosis or tectal mass may result in tonsillar herniation, CM-I, by exerting pressure from above (Fig. 1). Triventricular hydrocephalus can easily be identified by dilated lateral ventricles, a dilated and bowed third ventricle (Dlouhy et al. 2012), and without dilation of the fourth ventricle (Fig. 1). Another mechanism of hydrocephalus associated with CM-I is explained by fourth ventricular outlet stenosis resulting in pan-ventricular hydrocephalus and a bowed third ventricle (Fig. 2) (Oldfield et al. 1994; Suehiro et al. 2000; Amacher and Page 1971; Kasapas et al. 2015; Barr 1948). This can occur from increased compression and obstruction of the foramen of Magendie and Luschka by the herniated cerebellar tonsils. In addition to the herniated tonsils resulting in compression and narrowing of the outlet for the fourth ventricle, the foramen of Magendie can be encased in scarred arachnoid, with the brainstem descended into the area of the foramen magnum occluding the lateral exiting foramina of the fourth ventricle. This scarring effect is a well-recognized cause of obstruction of the outlet foramina of the fourth ventricle. At surgery, adhesive arachnoiditis can be found around the foramen of Magendie, which can be opened as part of the procedure. A history of a traumatic birth resulting in dense adhesive arachnoiditis is especially prominent in cases of CM-I associated with syringomyelia (Newman et al. 1981; Iwasaki et al. 2000; Hida et al. 1994). CM-I has a known association with other osseoligamentous abnormalities of the CVJ (Fenoy et al. 2008). These abnormalities include condylar hypoplasia, atlas assimilation, basilar invagination, Klippel-Feil syndrome with segmentation failure, an acute clival-canal angle, and others. These abnormalities may further decrease posterior fossa volume and further narrow the foramen magnum, thus worsening compression and fourth ventricular outlet obstruction (Fig. 3). Most cases of CM-I are not associated with hydrocephalus and the same is true of CM-I cases with syringomyelia. Most evidence suggests that compression of the cisterna magna by herniated cerebellar tonsils is responsible for the formation of syringomyelia (Oldfield et al. 1994; Menezes 1991). However, this interference with CSF flow only rarely results in hydrocephalus. One explanation is that the foramen of Luschka often remains open, allowing CSF to exit the fourth ventricle. When hydrocephalus is observed in a patient with hindbrain herniation, it is often difficult to ascertain which came first. As described above, herniation of cerebellar tonsils can lead to hydrocephalus, and the presence of hydrocephalus can lead to hindbrain herniation. Moreover, each problem may worsen the other. The consensus of management involves first addressing the hydrocephalus (Menezes et al. 2005; Dyste et al. 1989). In 25 patients presenting with hydrocephalus and CM-I with syringomyelia at the University of Iowa, all underwent ventriculoperitoneal shunting, with complete resolution of symptoms in 8. The other 17 required posterior fossa decompression (Menezes et al. 2005). The standard treatment of hydrocephalus has been CSF diversion with placement of ventriculoperitoneal shunt. Endoscopic third ventriculostomy (ETV) has arisen as an effective treatment for intraventricular obstructive hydrocephalus (Dlouhy et al. 2012; Drake 1993; Oi et al. 1999). ETV has been used to treat cases of obstruction of the foramen of Magendie with aqueductal patency (Suehiro et al. 2000; Mohanty et al. 1999; Cinalli et al. 1999). 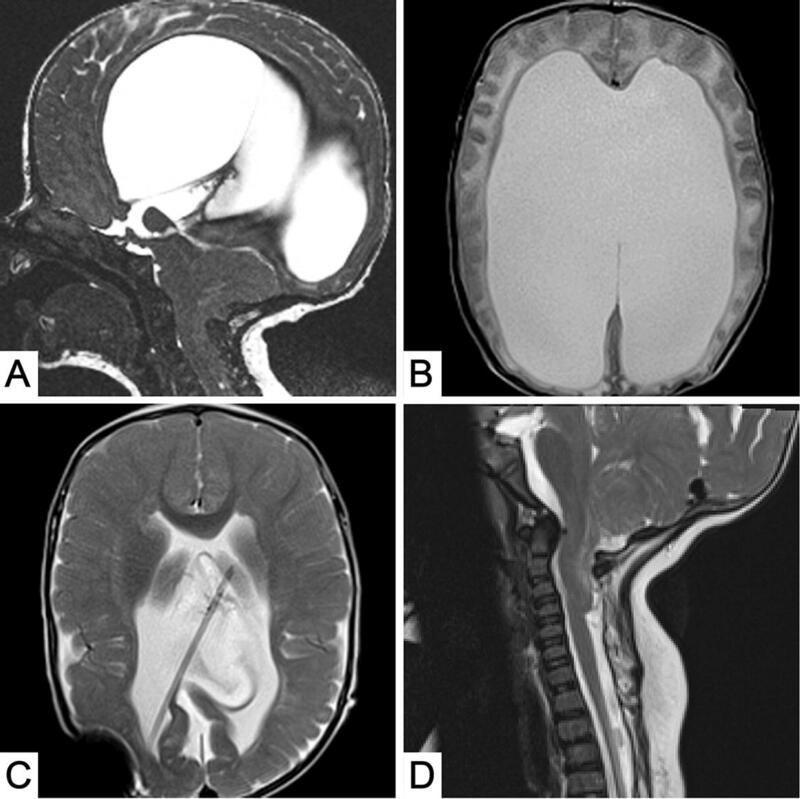 More recently, ETV has been shown to be effective treatment for intraventricular obstructive hydrocephalus associated with CM-I and communicating syringomyelia (Decq et al. 2001; Hayhurst et al. 2008; Massimi et al. 2011). In a study by Decq et al. (2001), five patients with CM-I and hydrocephalus treated by ETV were examined. The patients had a mean tonsillar herniation of 13.75 mm below the basion-opisthion line and a mean third ventricular transverse diameter of 12.79 mm and presented with intraventricular obstructive hydrocephalus related to obstruction of the fourth ventricular outlet, demonstrated by the absence of visible CSF flow on cine MRI. All patients underwent ETV with resolution of symptoms, a reduction in ventricular size, and significant decrease in cerebellar tonsillar herniation (13.75 mm to 7.76 mm). 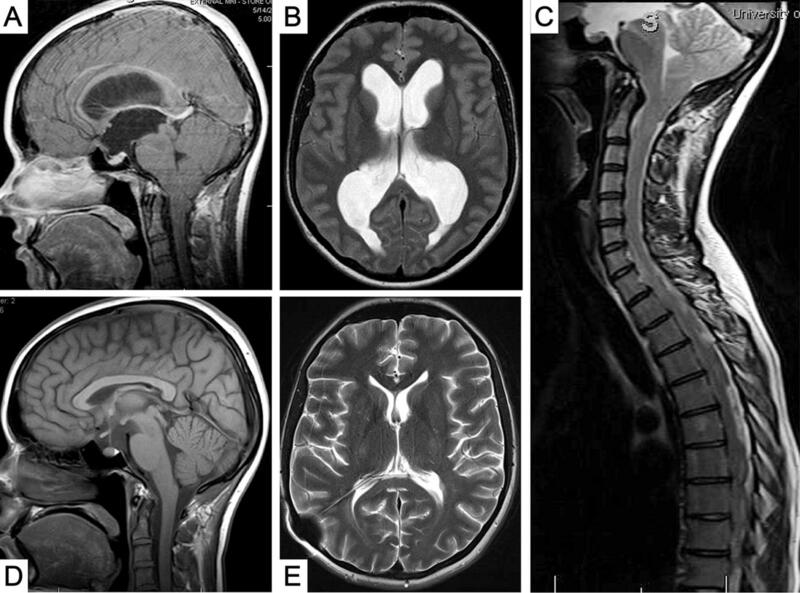 Along these same lines, a case of noncommunicating syringomyelia (syrinx that does not communicate with the fourth ventricle) associated with hydrocephalus was successfully treated with ETV (Metellus et al. 2002). In a study by Massimi et al. (2011), 15 patients with CM-I and hydrocephalus underwent ETV as initial treatment. Symptoms of increased intracranial pressure improved in all 15 patients. CM-I symptoms were present in ten patients and resolved in six of ten patients and improved in the remaining four patients. In six patients with syringomyelia, it resolved in three patients, improved in two patients, and remained stable in one patient. In a study by Hayhurst et al. (2008), 16 patients with CM-I and hydrocephalus underwent ETV as initial treatment. Fifteen patients remained shunt-free and asymptomatic from a standpoint of intracranial pressure. One patient who had a previous vp shunt that failed and underwent ETV had ETV failure which ultimately required replacement of vp shunt. Five of six patients with syringomyelia had improvement or resolution of the syringomyelia. Six patients required foramen magnum decompression for persistent CM-I or syringomyelia-related symptoms. The Chiari II malformation (CM-II) is intimately associated with myelomeningocele and involves vermian herniation with descent of the brainstem and fourth ventricle through a widened foramen magnum. The vermian “peg” may descend as low as the upper thoracic level (el Gammal et al. 1988; Tubbs and Oakes 2004). Other findings include cerebellar inversion with absent cisterna magna (“banana sign” on ultrasonography), hypoplastic tentorium that inserts very low placing the torcular Herophili just above the foramen magnum, and a medullary “kink” in two thirds of patients due to posterior displacement of a relatively mobile medulla along with a fixed spinal cord (el Gammal et al. 1988; Tubbs and Oakes 2004; Oakes and Tubbs 2004). As opposed to CM-I, where associated brain anomalies are rare, CM-II is associated with many brain anomalies. Skull findings include enlarged foramen magnum, craniolacunia, scalloping of the petrous bones, jugular tubercles and frontal bone (known as the lemon sign on ultrasound) (Nicolaides et al. 1986), increased concavity of the basioccipital clivus, low inion, and sometimes basilar impression and assimilation of the atlas (Naidich et al. 1980). Cerebral findings include enlarged massa intermedia (el Gammal et al. 1988), polygyria (McLendon et al. 1985), and agenesis of the corpus callosum. Below-average intelligence occurs in over half of patients (Venes et al. 1986). Other findings include prominent anterior commissure, absence of the falx with interdigitation of the occipital and parietal lobes, agenesis of the olfactory tract, absence of the cingulate gyrus, heterotopic gray matter, fusion of the colliculi (tectal beaking), cranial nerve nuclei malformation, and decreased cerebellar volume with dysplastic or absent folia. In CM-II, cranial and upper cervical nerves display an upward course (el Gammal et al. 1988). CSF flow abnormalities are abundant in CM-II. Hydrocephalus is seen in approximately 90% (Rauzzino and Oakes 1995). Other common ventricular abnormalities include a small, elongated low-lying fourth ventricle that can be displaced into the cervical canal, with outwardly projecting choroid plexus (embryological location), small aqueduct, “shark tooth deformity” of the third ventricle (anterior diverticulum), colpocephalic lateral ventricles, “beaking” of the frontal horns, occasionally absent inferior medullary velum, and occasionally absent foramen of Magendie (el Gammal et al. 1988). Meningeal abnormalities include low-lying and hypoplastic tentorium cerebelli, resulting in a vertical straight sinus and torcular Herophili near the foramen magnum as well as fenestrated falx cerebri. Syringohydromyelia occurrence ranges from 48% to 88% in CM-II (Tubbs and Oakes 2004). Development of the CM-II is likely associated with the open neural tube defect and drainage of CSF through the central canal during development (McLone and Knepper 1989). Without ventricular distention, the posterior fossa does not develop normally. This theory also explains the development of hydrocephalus, due to blocked CSF outflow at the foramina of Luschka and Magendie (McLone and Knepper 1989; Stevenson 2004). Nearly every patient with CM-II presents initially with an open neural tube defect. Frequently, the diagnosis is made in utero. Symptoms attributable to CM-II vary with age. In all age groups, symptoms are worsened with the presence of hydrocephalus. Patients younger than 2 years of age most commonly present with respiratory and gastrointestinal problems related to cranial nerve and brainstem abnormalities (McLone and Knepper 1989). Signs and symptoms include inspiratory stridor, vocal cord paresis or paralysis, apnea, dysphagia, aspiration, nasal regurgitation, absent gag reflex, and emaciation. Respiratory symptoms can be life-threatening and often require emergent treatment. In patients greater than 2 years of age, symptoms are typically not life-threatening. Signs and symptoms are more commonly related to spinal cord dysfunction such as spasticity, weakness, atrophy, dissociated sensory abnormalities and scoliosis, and cerebellar dysfunction such as ataxia and nystagmus. In adults, ophthalmic problems are common (Tubbs and Oakes 2004). In utero ultrasonography is typically the first modality, showing the characteristic banana sign (cerebellar hemispheres that are curved anteriorly with a small or absent cisterna magna) and lemon sign (scalloping of the frontal bones) as well as associated anomalies including myelomeningocele and hydrocephalus. In the neonate, plain radiographs and CT can reveal the small, shallow posterior fossa, scalloping lacunar skull, large foramen magnum, and concave clivus and petrous pyramids. MRI is the imaging modality that best defines the abnormality and associated CNS findings already discussed. In contrast to CM-I in which syringes occur in the upper cervical cord, individuals with CM-II tend to develop syringes in the lower cervical and upper thoracic cord. The tentorium arises laterally from low-lying transverse sinuses, and can be deficient, with an enlarged incisura that is heart-shaped. The interhemispheric fissure is serrated and opposing gyri cross the midline and interdigitate through the fenestrated falx. Post-contrast MRI can show enhancing choroid plexus at the caudal pole of the displaced vermis. Hydrocephalus requiring diversion is seen in approximately 90% of patients with CM-II (Tubbs and Oakes 2004; Rauzzino and Oakes 1995). In his initial theory, Chiari attributed the hindbrain herniation to the presence of hydrocephalus (Chiari 1891). Although hydrocephalus can lead to worsening of signs and symptoms associated with CM-II, there is significant evidence against hydrocephalus as the cause of the CM-II. In CM-II, the posterior fossa is abnormally small, with a low-lying tentorium insertion (sometimes just above the foramen magnum). Oftentimes upward herniation is seen, arguing against hydrocephalus as a cause of CM-II. Further arguing against hydrocephalus as a cause of CM-II, CM-II has been demonstrated prior to hydrocephalus on prenatal imaging, and over 10% of those born with myelomeningocele and CM-II do not develop hydrocephalus or require CSF diversion (McLone and Knepper 1989; Rekate 1985). There is evidence that many factors contribute to the hydrocephalus associated with CM-II. Some associations include the CM-II itself, aqueductal stenosis, anomalous venous drainage, closure of the myelomeningocele, and other CNS malformations (Stevenson 2004). In CM-II, the posterior fossa is small, the fourth ventricle is caudally displaced, and there is tonsillar herniation. The caudal displacement of the brainstem can cause increased resistance of CSF flow through the tentorial hiatus. There can also be occlusion of the outlets of the fourth ventricle, as in CM-I. The cerebral aqueduct can be stenotic, stretched, kinked, laterally compressed, or forked. This may add to the other abnormalities within the posterior fossa, creating functional obstruction (el Gammal et al. 1988). Additionally, problems with venous drainage due to a small posterior fossa have been implicated as contributing to hydrocephalus (Rekate 1985). The small posterior fossa volume and crowding at the foramen magnum can lead to compression of the sigmoid sinuses, leading to venous hypertension. Also, compression of the deep venous drainage system due to deformation of the midbrain can further contribute. Closure of the MMC often contributes to hydrocephalus formation. This is intuitive, and the presence of hydrocephalus can cause a cyclic phenomena in which the hydrocephalus worsens the cerebellar herniation, worsening the aqueductal stenosis and venous drainage, worsening the hydrocephalus, and so on. In the Management of Myelomeningocele Study (MOMS) by Adzick et al. (Adzick et al. 2011), the safety and efficacy of prenatal repair of myelomeningocele were compared with that of standard postnatal repair. It found that those who had undergone intrauterine MMC repair had a 40% need for shunt compared to 82% in the postnatal group. At 1-year follow-up, 44% of the patients in the intrauterine MMC repair group required shunting compared to 84% in the postnatal group (Tulipan et al. 2015). It has been postulated that the lower incidence of hydrocephalus was due to the absence of the obstructing effect of the hindbrain herniation. As stated above, the majority of patients with MMC and CM-II will have hydrocephalus (Fig. 4). This is in stark contrast to those with CM-I, who develop hydrocephalus much less frequently. Approximately 90% of those with CM-II and MMC will develop hydrocephalus, requiring a shunt compared to approximately 10% with CM-I (el Gammal et al. 1988; Tubbs and Oakes 2004). Asymptomatic children with CM-II, MMC, and mild or moderate ventriculomegaly and normal head circumference often need no treatment and can be observed. Rekate has developed criteria in deciding which children with dysraphism should not have shunts placed. Shunts may be avoided in those with cerebral mantle thickness of more than 3.5 cm and, at 5 months, normal development and no lower cranial nerve problems (Rekate 1985). 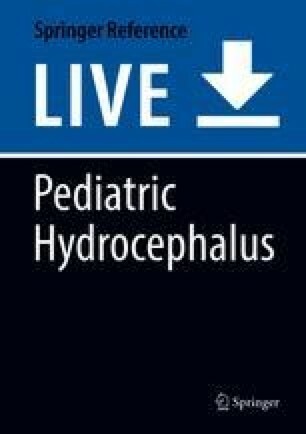 As with CM-I, all algorithms for treatment of CM-II involve first addressing and appropriately treating hydrocephalus. This means thoroughly evaluating the shunt in a shunted patient and evaluating the need for a shunt in an unshunted patient. Compared to CM-I, patients with CM-II and MMC present with hydrocephalus, requiring treatment at a much younger age, and this influences the type of CSF diversion as well as complication rate. The most frequent means of CSF diversion in those with CM-II and hydrocephalus remains ventriculoperitoneal shunting. As with other forms of hydrocephalus, alternative distal sites such as atrium, gall bladder, pleural space, or ureter are possible. Shunts require careful monitoring as at 10 years, up to 80% require revision. There is a higher infection rate during the first few months, possibly related to the open MMC, and this can be decreased if the defect is closed as soon as possible after birth. Endoscopic third ventriculostomy has been used to treat hydrocephalus in patients with CM-II and MMC, with a lower rate of success (Teo and Jones 1996; Jones et al. 1996). The success rate is approximately 30% when used as a primary mode of therapy (Jones et al. 1996). When used in shunted children returning with shunt malfunction, the success rate range increases to 50–80% in some series (Teo and Jones 1996; Jones et al. 1996). The increased success rate in patients with CM-II and shunt malfunction can be explained by at least two reasons. First, many of these children have obstruction due to aqueductal stenosis, which may be more treatable by ETV. Secondly, ETV has a higher success rate in older children, and those presenting with shunt failure tended to be older (Teo and Jones 1996; Jones et al. 1996). When contemplating ETV, it is important to study the CSF flow with dynamic sequence MRI, paying particular attention to flow through the aqueduct. It is also important to understand the abnormal anatomy of the patient with CM-II and MMC. Often the floor of the third ventricle is thicker, the third ventricle is smaller, and the septum pellucidum is absent. There is a higher incidence of scoliosis in those with MMC and hydrocephalus, and the scoliosis worsens in the presence of untreated hydrocephalus and improves with proper function of shunt. In addition to Chiari malformation, hydrocephalus can result from virtually any anatomic abnormality of the posterior fossa or CVJ that impairs flow of CSF from the fourth ventricle and/or venous drainage. Examples include basilar impression (Fig. 5), achondroplasia, craniofacial syndromes such as Crouzon’s or Pfeiffer syndrome, and others. Venous hypertension is thought to inhibit the absorption of CSF because, in order for CSF to be absorbed by the arachnoid granulations, the ICP must exceed the sagittal sinus pressure by 5 to 7 mm Hg (Olivero et al. 1988). Venous hypertension is thought to be the cause of hydrocephalus in multiple syndromes including achondroplasia and craniofacial syndromes such as Crouzon’s and Pfeiffer’s syndromes. It may also develop as a consequence of congenital heart disease, diaphragmatic hernia, and superior vena cava syndrome and, as mentioned above, can occur with myelomeningocele and CM-II. When it occurs prior to fontanelle and suture closure, ventriculomegaly develops because the skull is able to enlarge. If it occurs after closure of sutures, idiopathic intracranial hypertension develops. Marked stenosis of the jugular foramen with subsequent pressure differential has been demonstrated in achondroplastic patients (Steinbok et al. 1989; Bosemani et al. 2015). This in addition to narrowing at the foramen magnum can contribute to ventriculomegaly with mild to moderately dilated ventricles resulting in macrocephaly. However, the majority of achondroplastic patients with macrocephaly and dilated ventricles stabilize without intervention because of continued growth of the skull base. Papilledema is rare. For this reason, a period of observation and monitoring is recommended. Some suggest that imaging studies be reserved for patients whose head circumference crosses percentiles on the achondroplastic chart or those with unexplained neurological deficits. 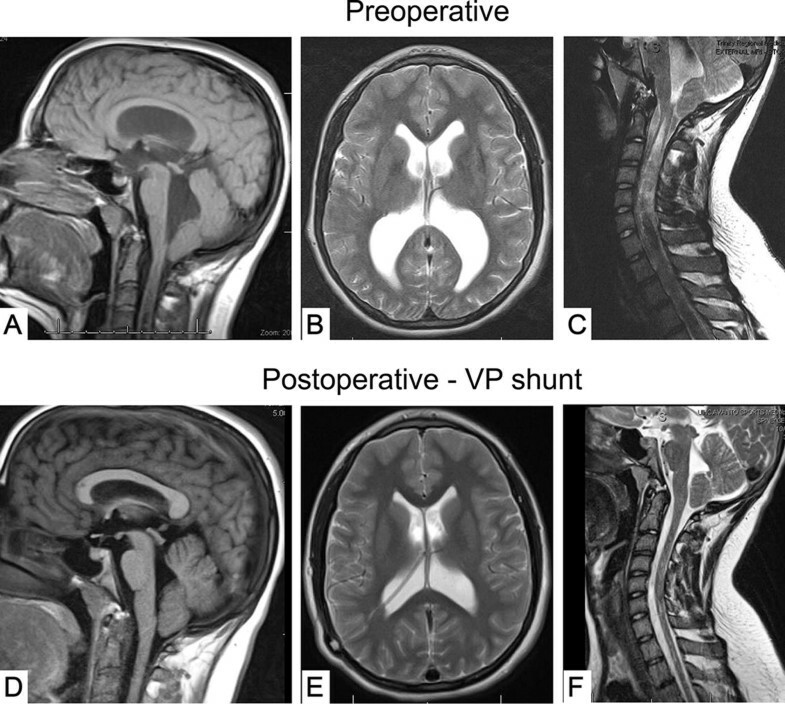 When patients exhibit signs and symptoms of hydrocephalus severe enough to warrant CSF diversion, ventriculoperitoneal shunting is generally recommended, as opposed to jugular foramen decompression (King et al. 2009). An analysis of intracranial venous drainage was studied angiographically in patients with craniosynostosis-related syndrome or nonsyndromic multisutural synostosis (Taylor et al. 2001). 51% to 99% stenosis or no flow at all was observed in the sigmoid-jugular sinus complex bilaterally in 11 patients or unilaterally in 7 patients. The authors, however, found no obvious correlation between ICP and degree of abnormality in venous anatomy. In many patients, a florid collateral circulation through the stylomastoid emissary venous plexus was noted (Taylor et al. 2001). Again, when patients exhibit signs and symptoms of hydrocephalus severe enough to warrant CSF diversion, ventriculoperitoneal shunting is generally recommended. CM-I and CM-II malformations are two conditions associated with abnormal posterior fossa and CVJ anatomy that have different etiologies, presentations, and imaging findings. CM-I and CM-II are associated with hydrocephalus in approximately 10% and 90%, respectively, due to changes they cause in CSF flow at the level of the craniovertebral junction. Any posterior fossa/CVJ junction abnormality has the potential to affect CSF flow, most commonly by fourth ventricular outlet obstruction/atresia or by abnormalities in venous flow. In nearly all symptomatic cases presenting with both hydrocephalus and Chiari malformation, the hydrocephalus must first be addressed. Hydrocephalus in the presence of CM-I has been successfully treated with CSF diversion (shunt) and ETV. Hydrocephalus occurring with CM-II is most commonly treated with shunting alone, with some success of ETV reported. Other conditions can increase venous pressure, resulting in ventriculomegaly. These conditions should be monitored carefully, and if the patient becomes symptomatic, a ventriculoperitoneal shunt should be placed.